The Turtles are up to their shells in trouble when a canister of toxic ooze falls into the hands of the evil Master Shredder. 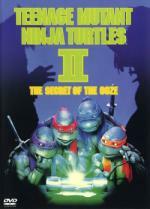 Aided by their new pal Keno, the pizza deliver boy, the Turtles take on Shredder and his mutant allies, Rahzar and Tokka, to capture and destroy the dangerous ooze and make the world safe again for Turtles, humans and pizza! I saw this one in Walmart for $5 so I decided to go ahead and pick it up since I had enjoyed the first one. This one has some entertaining moments too, though it isn't as good overall. Things are much sillier in general...and entirely too silly in some scenes. And Vanilla Ice turns up for some reason and does a horrible song. I am still trying to block that from my memory. The plot is sort of tied in to the first movie since it deals more with the ooze that is briefly mentioned in the first movie. The plot has potential by dealing with Shredder returning and by dealing with the ooze. Things just aren't handled as well as they could have been. The Turtles are mostly fine, though they do act too silly at times. They have their weapons, but they don't really use them, even in the fights. It seems like there was a bit effort done to make the movie more child friendly. Some of the humor works ok, but it could have been better. The fights scenes do look good even though they are more light on violence. The Turtles are basically the same as they were in the first movie. I think the suits have been changed a bit. The suits still look good and make things work. April is played by a different actress. She really doesn't have a lot to do in the movie. Casey, who ends up being a fairly important character in the first movie, is completely missing in this one and he isn't even mentioned - unless I missed it. That just seems odd. A new character, Keno a pizza delivery guy is added and he sort of takes the place of Casey working with the Turtles. Shredder still makes a decent villain. The movie is entertaining, but it isn't as good as the first one. I would suggest this one only for people who like the Turtles. I would have gone with a rating of 2.5 at Epinions, but since I don't have that option, I decided to go with 2. I did get a review posted if anyone would like to take a look. I don't have the third movie and haven't seen it, though I have seen the DVD for $5. I haven't decided if I'll get it just to finish the set of the movies or not.